The most innocent object can become dangerous when it is not used properly, and when you fail to follow the main safety rules. This is true for every device, from the smallest two-pound dumbbell, to something as heavy as a steel garage door, which can weigh upwards of three hundred pounds. The heavy panels aren't the only dangerous part of your door, though. You must never forget that there are plenty of other parts of the system that can hurt you in various ways. Springs and motor gears, for example, can lead to serious injuries when they are mishandled. Although most rules are based on common logic and experience, most people ignore them or believe that some theories are simply exaggerations. On the other hand, it is better to be prudent, take all precautionary measures and try your best to avoid accidents than suffer the smallest injury. Children must be protected because their innocence, combined with the natural curiosity, make them magnets for trouble. They usually do not fully understand the dangers of many things an adult would think obvious. Furthermore, sometimes when you tell a child not to do something, they become consumed by an overwhelming desire to do exactly that opposite of what you said. At least, it can certainly feel that way. At any case, you need to make sure they are fully aware of the fact that they should never play with your garage door remote or the door itself. Although children are more known for being reckless than adults, we aren't exempt from making foolish preventable mistakes. If your overhead door suffers a malfunction, you may be tempted to perform some DIY repair work. However, if you can't tell the screwdriver from the scissors, you may want to take a backseat. In fact, even if you do consider yourself to be an amateur handyman, a system as complex as an automatic garage door should be left to the experts. There are too many dangers involved to make it worth your while. You don't have to be an expert to check whether the opener safety reverse system works properly. The test is simple and won't take long. All you need to do is to place an obstacle at the entrance to your garage and then try to close the door using the opener. If it doesn't reverse and hits the object, then your opener sensors may have become misaligned. Their delicate condition means you should have a technician realign them, as opposed to trying to do it yourself. A routine examination of your garage door cables and springs can prevent a lot of unfortunate accidents. If a cable is loose, or a spring looks like it's about to break, you need to get them replaced as quickly as possible. You should also learn to detect problems by listening to strange noises. A damaged track and worn out rollers can be easily detected by the grinding noise they make. Regular maintenance can help prevent these issues. 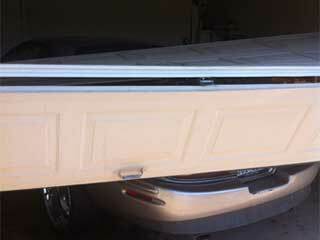 Contact our team at Garage Door Repair Diamond Bar today for more information.